pattern quilt that supposedly leads to a great treasure. curator, contacts Izzy and says that Grandma Isabella promised him the quilt. or a journey that will lead her to the treasure her grandmother intended? I love how Izzy is named after her grandmother Isabella, and how close their relationship was with each other. The love she had for Izzy was evident. Isabella goes to great lengths to help Izzy unfold the mystery of the quilt, while helping her to heal from her death as well. She sounds like such a great grandmother, and continues to be a blessing after her death. Izzy has to care for her own over dramatic mother when she breaks her leg and shoulder. Then add on to that her brother is having financial issues and has to move in with Izzy too! The family dynamics are chaotic, and it is no wonder that Izzy was so drawn to the love of her grandma. 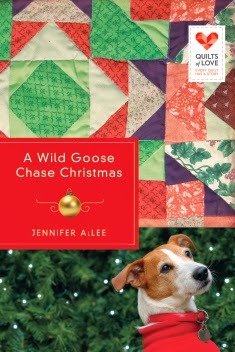 I loved this book, and the flying geese pattern. It was a great Christmas read that captured me from the beginning. room with his head down. one, couldn’t believe this sweet old man held any danger. tied box from behind his back and held it up in front of him. needed her. This unexpected gift only made things worse. With slow but steady steps, Virgil entered the house.